I lately found this picture in the internet. A tweet pointed me to it and I had a hard time to breathe normally again after I rolled laughing over the floor. This really contradicts every experience I made with ‘good old’ Germany. About five years ago a friend of mine, Kenyan with an master in computer science from a well known Russian university, wanted to come to Germany for work because she had several friends in Germany. Another friend of mine who runs his own software development company was willing to see her. Because, like most of the time, everything went on short notice she didn’t have the time to apply for a business visa and came with a visitor visa to Germany. After the successful interview with my friend she tried to get a working visa but was denied and had to leave Germany again. Everybody who is following the news should know by now that the demographic changes in ‘good old’ Germany are already leading to a lack of skilled workers because the Germans are getting too old. So how can it be that a civil servant can deny someone who is skilled and has a job opportunity in Germany the appropriate visa? My wife is Chinese. We married in Switzerland and left for China because she wanted to pursue her career as judge. After a while and because her Chinese career was ended by marring a foreigner, we tried to go to Germany. Hahahaha … don’t worry I will never try to come back to Germany again. It seems that my wife only gets a visa for Germany when she is able to speak German. As it is she speaks fluently four languages but unfortunately German is not between those. 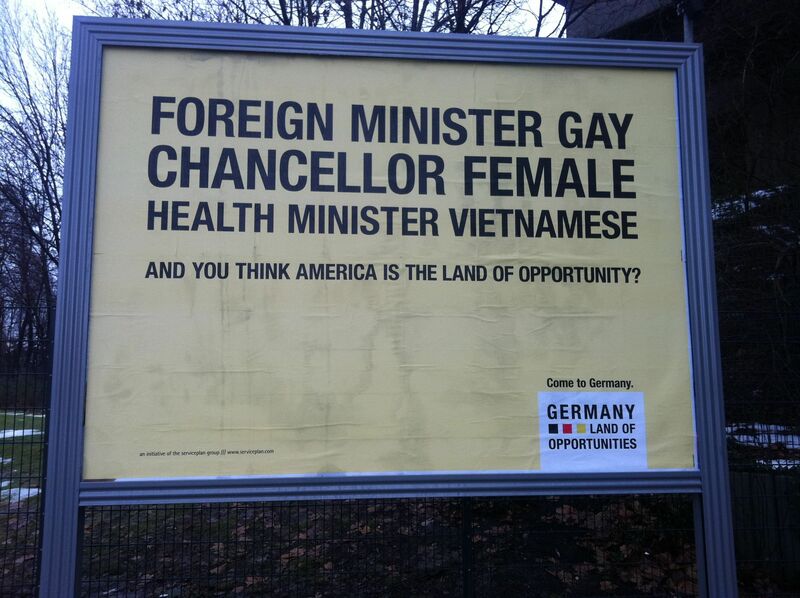 This entry was posted in Germany and tagged foreigner, tolerance. Bookmark the permalink. If we in Germany would really benefit from these people on the poster, I would think about changing my gender or becoming a gay 😉 These girls and guys are almost a crying shame. I can only agree with you. One reason why I left 😉 But I would not look so far into the future. I think that the light will go out much earlier. I am sorry Dyrathror could you tell us where do you live now,so we can come there and have a good way of life as you and your have have!